Since March 19 the Pope has not made any Marian references, but I anticipate that he will during Holy Week. Today I thought I would share a few links to news articles that have surfaced regarding Cardinal Bergoglio/Pope Francis’ Marian devotion. 1. Cardinal Bergoglio was inspired by the example of Pope John Paul II who prayed 15 decades of the rosary everyday. Because of John Paul II, Pope Francis began to pray 15 decades of the rosary each day. Read more here. 2. 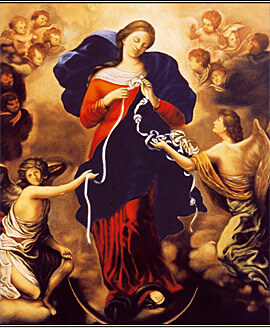 Many sources have indicated that Cardinal Bergoglio has a devotion to Mary under the title “Undoer of Knots.” It is a devotion rising in popularity. Dr. Taylor Marshall gives a good overview here. Pope Francis also gave an image of Mary, Undoer of Knots, to Archbishop Chaput of Philadelphia.